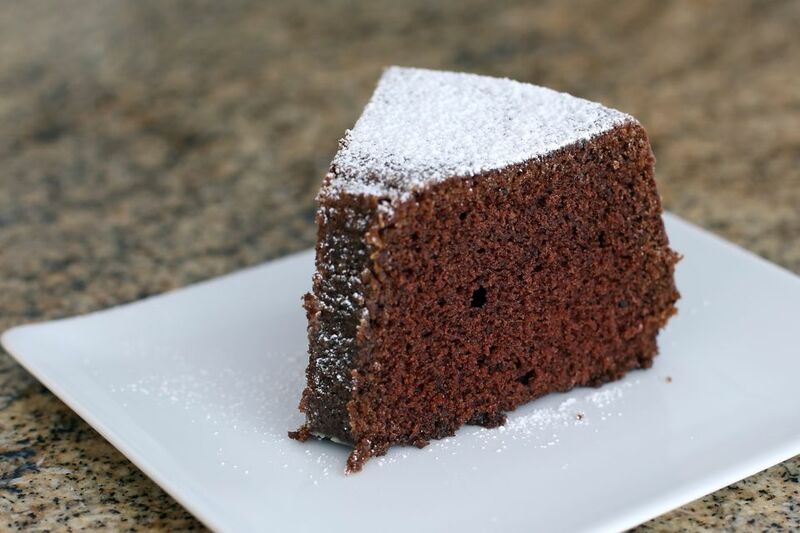 This amazing chocolate pound cake is super moist and full of flavor. This is one of my favorite cakes, and it is so easy to fix. I baked the cake in a one-piece tube cake pan. A Bundt cake pan would be good as well. Frost the cake or drizzle with a thin glaze, or simply sprinkle the cake with powdered sugar and serve it with warm preserves, whipped cream, or custard sauce. If you think it's too much cake for your family, freeze half of the cake or freeze individual slices. In a small bowl, pour boiling water over the chocolate; set aside to melt, then cool for about 20 minutes. Grease and flour a tube cake pan or Bundt pan. Preheat oven to 325°. Sift flour into a bowl with salt and baking soda. In a large mixing bowl with an electric mixer, beat the butter and brown sugar for 2 to 3 minutes. Add the eggs, one at a time, beating well after each addition. Add the vanilla and beat for 3 to 4 minutes, until light and fluffy. With the mixer on low speed, beat in flour mixture, alternating with sour cream and ending with flour mixture. With the mixer on the lowest speed, beat the chocolate mixture into the batter until just blended. Bake the pound cake for about 1 hour, or until a wooden pick or cake tester comes out clean. Cool in pan on a rack for 10 minutes. Invert the cake onto a cake plate and continue cooling. Sprinkle sifted confectioners' sugar over the cooled cake or drizzle an icing or glaze over the cake. Alternatively, serve the cake with a rich vanilla custard sauce or a drizzling of cherry or raspberry preserves. To freeze part or all of the cake, wrap the completely cooled cake in heavy-duty foil and freeze for up to 6 months. To freeze individual slices, arrange them in a single layer on a parchment paper-lined baking sheet and freeze. Wrap the frozen slices in plastic wrap or heavy-duty foil for up to 6 months. Thaw frozen cake or slices at room temperature.